The webcast will take the attendee on a journey through the threat landscape taking in sights such as the latest activity on Trojans and viruses, how the bad guys are stealing intellectual property through the use of malware, the future of cyber warfare and how hacktivism has changed the threat landscape for the foreseeable future. 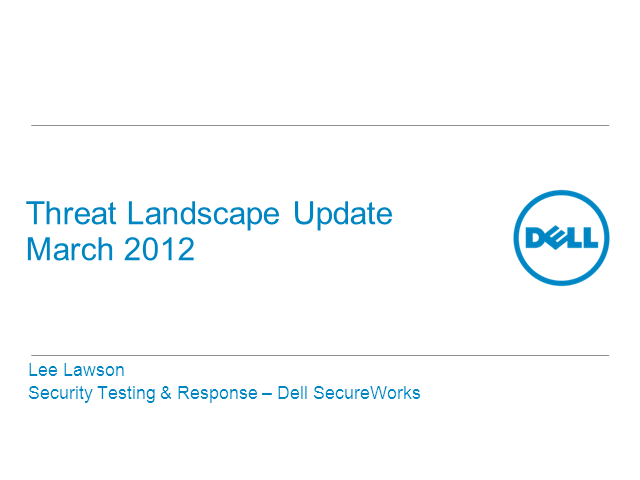 • What has Dell SecureWorks observed across its client base in 2011, and what 'new' behaviours have been identified? Dell SecureWorks processes more than 20 billion security events across thousands of networks around the globe on a daily basis, leveraging the Counter Threat Unit (CTU) research team who perform in-depth analysis of emerging threats and vulnerabilities. This global visibility and unmatched expertise enables early warnings and actionable security intelligence to customers to protect against threats and vulnerabilities before they impact their organisation. Lee Lawson is the Solutions Architect for Security and Risk Consulting Services at Dell SecureWorks EMEA. In this role he is in charge of envisioning and creating combinations of new and existing services to solve the most unique and difficult customer problems. with a deep knowledge of the subject having led complex and challenging projects for customers in all industries. Lee often speaks at information security related events for the public and industry insiders and is considered a thought leader in threat landscape.